Hello all, I may be setting a new trend here, with two posts in one day. There is much I would like to write about, just too little time. It's time to update you on what I've been listening to lately. Some good, some less good but all interesting. My new favourite in the podcast space is the BBC Radio 4 Friday Night Comedy Show, which alternates between the Now Show and the News Quiz, both VERY entertaining, both worth the weekly listen. It is possibly the most accessible of all the BBC Radio 4 shows, which can at times seem incredibly opaque and elitist, two qualities I particularly enjoy but I can see how that may not be a mainstream opinion. This show is kind of an audio version of QI, where instead of focusing on a particular theme like Stephen and his mates do, Sandi Toksvig uses the newspaper headlines as the basis for the show and believe me, she need not go very far to point out the absurdity and idiocy of some of the stuff that comes out of those papers. The UK National Government and David Cameron cop a fair bit, but then again, I tend to feel like it is rather deserved. I've also been toying with 'Stuff You Should Know' run by HowStuffWorks.com and presented by Chuck Bryant and Josh Clark but I am giving it a mixed review. It's low-key, it's playful but in my honest opinion, it is a lazier and less well edited version of Radio Lab. The focus is slightly different too. Whereas Jad Abumrad and Robert Krulwich focus on storytelling as the medium for exposing the facts, the SYSK guys take a more classical encyclopaedic approach, where they list all the things you should know about a given topic. It feels like there is a lot of research behind each version of the podcast but because they don't interview people and get expert advice, it really falls flat on its face sometimes when Chuck and Josh just don't have the answers. And sometimes, they get it plain wrong anyway. So any suggestions or examples you can point to would be great! Hello all out there, It's been a little while. Sorry for letting you hanging there, I went back to work, as you can tell. Shame really, because I could have made this blogging business a full-time gig the way I was going at it! So I am back with a vengeance: I have discovered new treasures in the podcast world. And who else to share it with than the rest of the world via my little blog? 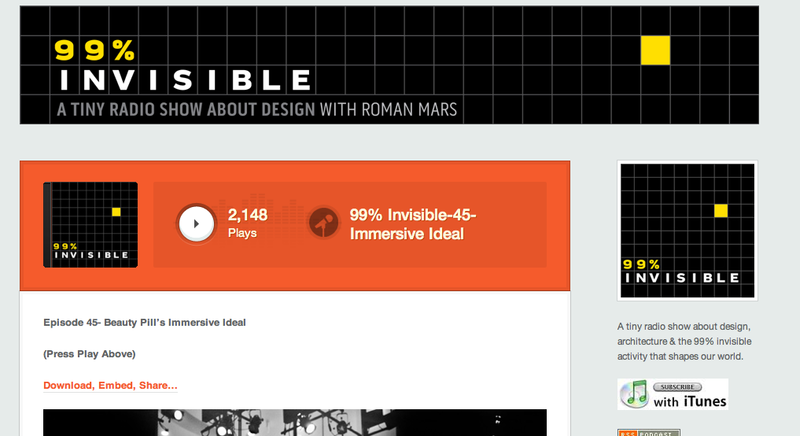 The first new discovery is '99% invisible' a podcast by Roman Mars. I discovered it whilst listening to Radiolab, one of my old favourites and Jad Abumrad featured a few episodes of Roman's podcast on his own show. To be honest, it's a pretty bold and cool thing to do: Use your airtime and your audience to promote someone else's superb work. I appreciate that about public radio, it makes things so much better, for everyone.... So I took the opportunity of getting a new iPhone (don't ask what happened to the old one, not a happy memory) and downloaded some episodes of 99% invisible. The concept is that 99% of design is invisible, it precedes the development of objects and built form. The idea of focusing on how design does not only relate to actual result but is also an upstream process has a lot of appeal to me. To be honest, it's what I make a living out of, so hearing someone engage with that idea in such a public forum was really music to my ears (no pun intended). I haven't listened to the whole season, but the episodes I have gotten through so far have been spot on: The Pruitt-Igoe Myth, The Biography of 100,000 sq feet, the Feltron Annual Report and the Design of Airport are investigations into the unacknowledged labour and invisible decision-making culture which underpin the objects we interact with and the cities we live in. Seriously awesome work. The second discovery is another BBC Radio 4 treasure called 'The Secret History of Social Networking'. It's about time someone made a proper show on what has effectively revolutionised our expectations of communication and information! Rory Cellan-Jones investigates the origins and the current developments in social networking. Facebook, Twitter and other usual suspects predictably make the bill, but the more fascinating explorations are those of networking platforms that have been around for a while like The Well and other electronic community dashboards that started making an appearance as early as the 1970s. Again, there's much more to discover there, but I will be interested in following the evolution of the podcast, as social media-type functionalities become the benchmark for most information interfaces in the future. So this is a long-winded introduction to the topic of this post: Duran Duran and the forecasting of digital technologies. It must have also been ironic that the TV was running a Duran Duran marathon on MTV. I have not watched MTV since my brain-dead teens, so it was a real blast from the past to see these guys at it on the screen. Beside the fact that they were absolutely ridiculous and that the videos are hilarious to watch for all the weird dancing, hairstyles and strange scenarios (clearly scripted under the influence of something), some of the videos actually showcased what was meant to be a futuristic use of technology. It's strange because Duran Duran were amongst the first band to actually shoot music videos professionally using 35mm. They had directors, make up artists and the rest of it to put together these extremely experimental and whacky videos. I wasn't really around for much of Duran Duran's prominence (I think there were at their height in the early 80s) but I remember 'Ordinary World' very distinctly (it's actually stuck in my head as I write this, damn). So during the course of the meal which consisted in two small, but delicious, tacos, I was able to watch about 8 music videos by Duran Duran. I've selected two for you that I think are simultaneously amazing precursors to how we use technology today, but also ridiculous extrapolations of the way telephones and computers were being used at the time. The first is the video for Rio, released in 1982. 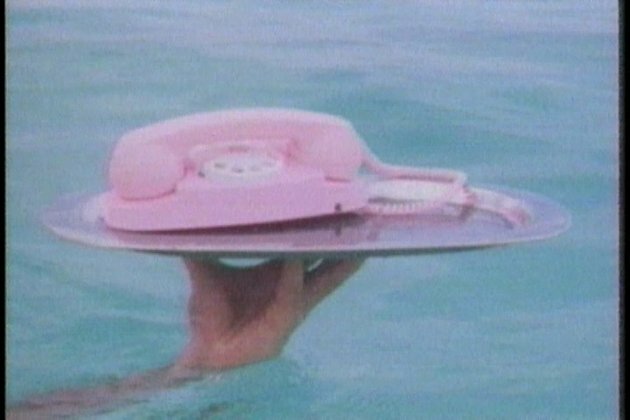 In this video, the band is out on a couple of yachts in Antigua or somewhere like that and use colourful fixed telephones to call each other from yacht to yacht. I think one of the guys is vaguely chasing a woman wearing nothing but body paint, while the saxophone player has been relegated to a mere raft drifting through the ocean. What is interesting here is that Duran Duran were using an idea of mobile communication, but didn't get what the technology might look like. They used just traditional phones that require a phone line to be plugged into them, but without the wire. I suppose they were just on the cusp of inventing the first mobile bricks at the time, but it is still hilarious. It's well worth having a look at Retrobrick, a site for collectors of vintage phones to discuss and exchange paraphernalia. The Rio video is embedded below. The second video is 'Planet Earth'. Not sure whether this was a precursor to an environmentally conscious version of soft rock, but it does feature live data feeds in rudimentary code overlaid onto images of the band dancing on weird platforms. What this information adds to the plot of the video is not clear to me, but again, there was something of a hunch in this. Duran Duran had clearly sensed that these big things called computers were leading us into an increasingly digital age where information would come to us as if we, also, were programmed to read code. And also, let's not forget, Simon Le Bon is just hilarious when he dances. I am no expert in music, and even less so in Duran Duran, but I do enjoy looking back at the way people thought technology would shape our world in the past. Although it is more entertaining to make fun of Duran Duran for their interpretation of the future, there are also some clear insights in there. If you're a Duran Duran fan, please add the conversation, I would love that.